"NBA Ballers: Chosen One will allow players to live the life of an NBA superstar," said Steve Allison, chief marketing officer, Midway. "Featuring new competitive combo and super-move systems, the NBA Ballers Franchise returns with the amazing realistic graphics for which the franchise is known as players take part in the ultimate challenge to become the next 'Chosen One." For me the title brings to mind at best The Matrix Trilogy, and at worst Berry Gordy's 1985 martial arts classic, The Last Dragon. If you don't achieve 'The Glow' when you reach Chosen One status, the game ain't worth buying. Sho'nuff! CHICAGO - November 27, 2007 - Midway Games Inc. (NYSE: MWY), a leading interactive entertainment software publisher and developer, today announced NBA Ballers: Chosen One as the next installment in its top selling NBA Ballers franchise. The fast-paced one-on-one and two-on-two action returns as players can select from more than 65 NBA superstars to be the next "Chosen One". 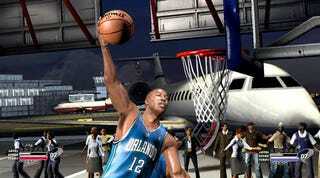 NBA Ballers: Chosen One is scheduled to ship for the Xbox 360™ and PlayStation®3 computer entertainment system in Spring 2008. With an optimized next-gen graphics engine, NBA Ballers: Chosen One will continue to set the bar for graphic quality, with the most true-to-life athlete likenesses seen in a sports video game. The franchise's hallmark pick-up-and-play gameplay allows Ballers of all skill levels to master combos and pull off amazing super-moves as they hoop-it-up with the best players in the NBA.